Pro Water Inc. is an equipment rental and service company specializing in water wagon, water truck, and paddle wheel scraper rentals. We serve all of Southern California, including Orange County, Riverside County, San Bernardino County, and Los Angeles County. Our Caterpillar water wagons and paddle wheel scrapers are all in excellent condition and well maintained, providing reliable water service and earth moving equipment to your construction jobsite or grading contractor. Water wagons, also called water pulls, provide the same type of service as a water truck, but on a larger more effecient scale. Proper watering is very important to maintain soil compaction, soil moisture, and to follow construction regulations and guidelines regarding dust pollution. We offer two sizes of water wagons: an 8000 gallon 621 B Water Wagon and a 10,000 gallon 631 D Water Wagon. These water pulls provide excellent coverage and watering to your earth-moving project. Our professional water truck service is second to none! We take pride in providing reliable water trucks to help you meet your watering needs. 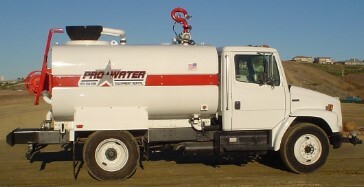 Water trucks are perfect on small grading construction, such as grading a lot for custom home, a park, new playing fields, and other small to mid-size construction projects. Paddle wheel scrapers are often the right equipment for the job. A paddle wheel scraper, often a Caterpillar 623, is great for moving dirt in an efficient, effective way. 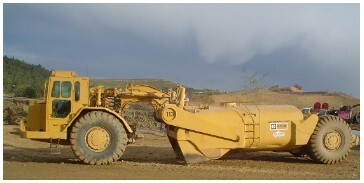 Regular scrapers, including Caterpillar 651 and Caterpillar 657 (push-pull scrapers) are often used on large-scale earth moving jobsites, but rely on many pieces of support equipment. Paddle wheel scrapers can remove dirt more precisely and don't need to rely on bulldozer push-cats or other scrapers for power. All of our equipment is powered by Tier 3 compliant "Green" engines. We have made considerable investments into our equipment in the past couple of years, completely replacing all of our engines to meet the Air Quality Management District's (AQMD) strictest requirements for air quality.